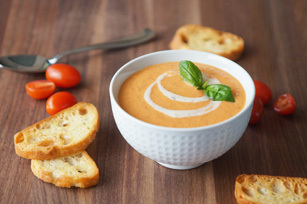 Tomato soup is classic comfort food. In this twist on the popular soup, roasting the vegetables adds depth and flavour. Herb & garlic cream cheese gives the soup a silky-smooth finish. Toss vegetables with oil on parchment-covered rimmed baking sheet; spread to form even layer. Bake 30 min. or until vegetables are softened; cool 5 min. Spoon vegetables into large saucepan. Add broth; blend with immersion blender until smooth. Mix cream cheese product and milk until blended. Add to soup; mix well. Cook on medium heat 3 to 5 min. or until heated through, stirring constantly. If you don't have an immersion (hand-held) blender, you can use a regular blender instead, adding the vegetable mixture to blender in small batches to blend until smooth. Serve as an appetizer soup, or combine with a grilled cheese sandwich for a classic lunch-time duo.